I want to ask everyone to generate the pure frame of mind while receiving Lord Buddha’s instructions. One aspires to benefit all living beings and therefore listens attentively. 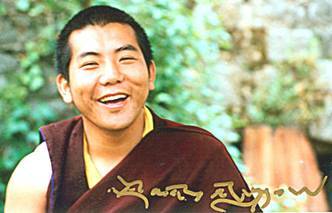 You may have heard many times about the importance of maintaining the pure motivation while receiving the teachings. It is said that one needs to be free of three faults that are compared to a vessel when learning about the Buddhadharma. The first fault is likened to a vessel turned upside-down. Nothing can flow into the container, which is the fault of being inattentive. One needs to be interested in the teachings, appreciate, and feel joy that one is receiving them. The second fault is compared to a bowl with holes in the bottom. Whatever is poured into the bowl inevitably leaks out again, which is the fault of not remembering the teachings. The error of forgetting the instructions is caused by not really being interested and not having enough devotion for Lord Buddha’s words. One should remember that all teachings originated with Buddha Shakyamuni, so one needs to receive them with three kinds of confidence. They are: trusting, longing and clear confidence. If one listens to the Buddha’s teachings with devotion and respect, then one is free of the second fault. The third fault is compared to a perfect container that has no holes and is turned upright, but it is filled with poison. Anything poured into the bowl automatically becomes contaminated. Similarly, one needs to be free of an impure attitude while receiving the sacred teachings. It is important for a disciple of the Buddhadharma to generate and cultivate bodhicitta (“the enlightened mind of awakening”) by receiving the instructions on the four immeasurables and by contemplating them in order to meditate correctly. The four immeasurables that embrace all living beings and exclude no one are: immeasurable love, immeasurable compassion, immeasurable joy, and immeasurable equanimity. A practitioner first needs to develop genuine love by wishing that all living beings have happiness and the causes of happiness. How does one do this? One contemplates that everybody was once one’s kind and dear parent. Knowing that one wants to be happy and free of suffering, one understands that others have exactly the same wish. Since beings, our parents in our many past and in our present life, do not really know how to attain reliable happiness and how to actually eliminate suffering due to the force of ignorance, they endlessly wander in the vicious rounds of samsara. One generates genuine love for them by wishing that everyone has ultimate, lasting happiness and by praying: “May all beings enjoy happiness and have whatever causes true and reliable happiness.” This is the first immeasurable contemplation. Cultivating genuine love weakens and eventually relinquishes any ill-will and bad feelings that one might have. Genuine love is the basis for having compassion. If one has genuine love for others, then one’s intentions and actions will change. One doesn’t only wish that everybody has happiness and its causes, but one has the sincere wish that they be free of suffering and its causes, which is what having genuine compassion means. What is the cause of suffering? Ignorance that makes one cling to duality. One understands that sentient beings in the six realms of conditioned existence experience the three kinds of mental anguish and physical pain due to ignorance. The six realms of conditioned existence are the six modes of existence caused and dominated by a particular mental poison. They are: the realms of hells (caused by anger), hungry ghosts (caused by miserliness), animals (caused by ignorance), humans (caused by desire), demigods (caused by jealousy), and gods (caused by pride). The first two kinds of suffering are: the suffering of suffering and the suffering of change, which are easily comprehendible, i.e., due to the truth of impermanence and due to having been born, every living being not only experiences the suffering of change, but is also subject to the suffering of sickness, old age, and death. It is important to understand the impact of the third kind of suffering, which is all-pervasive suffering that is due to self-cherishing. Clinging to a self brings forth birth in dependence upon the five skandhas (“aggregates of being”), which are the five principal mental and physical constituents of a being. They are: form, sensations, recognition, mental events, and consciousnesses. All living beings want to be free from inadequacies of conditioned existence, samsara, but lead their lives over-powered by clinging to the five skandhas as a self and consequently experience suffering. Even while doing whatever they can to find happiness, due to the inability to really know how, living beings only accumulate more causes and conditions for future suffering and pain. This is all-pervasive suffering. We understand that no single living being wants to suffer, but does so on account of karma (“the infallible law of cause and effect”). We learn to feel for their situation and pray: “May all living beings be free of suffering and whatever causes suffering.” This is the second immeasurable contemplation, that of genuine compassion. Cultivating genuine compassion weakens and eventually eradicates one’s self-cherishing. Having developed immeasurable love and immeasurable compassion, we pray: “May nobody ever be separated from genuine happiness that is free of suffering.” We feel joy that they have fortunate conditions and circumstances, which is the fourth immeasurable contemplation, that of genuine joy. Increasing our joy about others’ beneficial accomplishments and their prosperity weakens and eventually eliminates any hesitations we might have and our despondency to be there for others. We realize that the frustration and anguish that living beings feel are based upon their wish to be happy and to be free of suffering, their fear of losing any happiness they have accomplished for themselves, and their fear of experiencing pain. With such hopes and fears in mind, they accept whoever and whatever they think will help them achieve their aims and reject whoever and whatever obstructs them. Being biased and prejudiced, they increase their attachment and aversion, which are the source of suffering. We pray: “May all living beings abide in great equanimity that is free of attachment and aversion to things that are near and things that are far.” This is the fourth immeasurable contemplation, that of immeasurable equanimity, i.e., impartiality. Cultivating genuine equanimity weakens and eventually helps us overcome our biased feelings of sympathy for some and antipathy towards others. Our deeply rooted immeasurable love, immeasurable compassion, immeasurable joy, and immeasurable equanimity are the four immeasurables. But how should the description “immeasurable” be understood? It does not refer to quantity. As explained in my lecture on The Right View, Right Meditation, and Right Actions, one needs to be impartial if one wants to practice meditation correctly and one needs non-discursive wisdom-awareness in order to realize the indivisibility of the relative and absolute truths. Right meditation enables one to realize the inseparability of skilful means and wisdom-awareness. Lord Buddha taught us to develop and cultivate bodhicitta, which cannot be immeasurable as long as one does not have genuine love, compassion, joy, and equanimity. Unifying the practice of skilful means with the study of wisdom-awareness engenders an immeasurable frame of mind, and, having accomplished this aim, one’s love, compassion, joy, and equanimity will be immeasurable. Skilful means also refers to the six paramitas (“perfections”), which are: generosity, ethics, patience, enthusiastic endeavour, concentration, and wisdom-awareness. Generosity and the other four practices are not perfections unless they are united with the sixth paramita, which actually means being free of believing in the true existence of a subject, an object, and an action. An advanced practitioner knows that there isn’t anybody who really exists as otherwise supposed and there is not anybody who receives anything truly existing through an action that is not real either. Perfection means not clinging to those factors while performing the first five paramitas. Having realized emptiness, i.e., having attained the sixth paramita, one has realized non-duality, i.e., one has a non-discursive and impartial state of mind in that one is free from clinging to any mental constructs and fabrications. Therefore, when one has genuine love and genuine compassion, one doesn’t think, “I am engaging in love and compassion towards others.” And that is why many teachings, especially those given to us by Lhaje Gampopa in The Jewel Ornament of Liberation, stress that practicing skilful means together with wisdom-awareness is indispensable if one aspires to accomplish the goal, which is realization of buddhahood. Disciples of Buddhism know that emptiness is a central topic of study, but many students make the mistake and think that it isn’t necessary to accumulate merit by engaging in virtuous activities when they learn about emptiness. Traditionally, such an attitude is called “decorating oneself with emptiness.” Anybody who decorates himself or herself with emptiness hasn’t understood that skilful means and wisdom-awareness must be practiced together. In the same way, many students make the mistake of thinking that it isn’t necessary to accumulate wisdom and as a result have false expectations and experience fear and frustration when things go wrong. They, too, haven’t understood that skilful means and wisdom-awareness must be practiced together. By the virtue of uniting the practice of skilful means and the study of wisdom-awareness while following the path, disciples accumulate merit and wisdom. The accumulation of wisdom means that by relinquishing emotional obscurations or obscurations of disturbing emotions that prevent one from becoming free from samsara, one achieves realization of emptiness and knows how things really are, which is the first purpose of practice. The accumulation of merit means that by relinquishing obscurations of knowledge that prevent one from gaining accurate knowledge, one knows how things manifest and achieves realization of skilful means, which is the second purpose of practice. An accomplished practitioner is more and more able to effortlessly help all living beings in accordance with their propensities, abilities, wants and needs. By virtue of having perfected the accumulation of wisdom and merit of skilful means, two immeasurable qualities manifest. An advanced practitioner benefits himself or herself by having overcome subtlest obscurations that are latent tendencies (i.e., obscurations of dualistic perception) and thus has realized the true nature of all things. Furthermore, advanced practitioners benefit others by having attained complete realization of their own mind’s unimpeded nature and then they can help others most reliably. If you have any questions, please ask. Rinpoche: With respect to the creation phase of practice, i.e., skilful means, while lacking wisdom, one takes a meditation deity as concrete and real. Clinging to the visualization as real is clinging and therefore is impure. With respect to the completion phase of practice, while lacking skilful means, practitioners think that nothing exists after having learned about emptiness, or they think that accumulating merit by engaging in virtuous activities is senseless, or they think that karma isn’t true. Rinpoche: It’s quite the opposite. Immeasurable compassion means knowing that the enlightened nature abides within every living being without exception. Although it abides in everyone, living beings are confused and, failing to recognize their true nature, experience suffering and pain. Knowing that all living beings have the Buddha nature, genuine compassion for them is born in our mind. We should not look down on anybody, but understand their situation. The instructions that His Eminence the Third Jamgon Kongtrul Rinpoche kindly offered were presented in Vancouver, Canada, in 1990. Translated into English by Chöjor Radha, transcribed by Gaby Hollmann from Munich in 1991 & edited in 2009, solely responsible & apologizing for all mistakes. Photo of Rinpoche courtesy of Lee from Puli-Nantou. Photo of lotus taken & offered by Lena Fong from San Francisco. Copyright Jamgon Kongtrul Labrang, Pullahari, Nepal, 2009.
bring peace and happiness to all living beings!